Enjoy the smell of pine-scented cleanliness with this Advantage Chemicals 1 gallon container of pine cleaner. This economical cleaner is perfect for public buildings and restrooms thanks to its large size and deep cleaning qualities. Formulated with detergent builders, rinsing agents, water conditioners, and soil penetrating agents, this deodorizing cleaner enhances the quality of cleaning in your establishment by providing a recognizably fresh scent. I like this Pine Cleaner and Deodorizer, make all the floor clean and perfumed. The price is good and the quality is ok, you can mix it with a different cleaner as sanitizer if you may need. This pine cleaner smells better than the well-known original brand. Not only does it smell better but it cleans better, without a doubt! Great purchase! Good floor cleaner that smells awesome! We recently bought the entire case and found one of the bottles leaking slightly. Hence the 1 star deduction for not packing so it would not get damaged / leak. A great cleaner for small jobs. We needed something a bit stronger for our kitchen and other heavy traffic areas. Bathrooms and counters, works great. We enjoy using this pine cleaner, Similar to pine-sol and its cheaper for the 1 gallon. Smells nice and it gets the job done. highly recommend! This pine cleaner is great for the floor and bathrooms. The only thing that we as a business don't like about it,is the overpowering smell that it gives. There is a need to use little of it or diluting it with water in a smaller container. But otherwise, great durable product! My mom and I absolutely love this pine cleaner! Just as good as the big box store brands at a much cheaper and affordable price! the pine smeel is equal to nay name brand on the market and it's effectiveness is unbeatable. same value as the other brand but the costs it alot better for company use. The Advantage Chemicals pine cleaner is amazing and smells wonderful. The perfect all purpose cleaner for kitchens or bathrooms. Ideal for any budget and business. Basic cleaner at a very good price! Does it’s hob of cleaning from wiping down counters to mopping floors. Love the fresh smell it leaves behind. This cleaner does clean well and has a wonderful pine scent that makes my house smell so clean. It could be used as a cleaner through out the whole house from the bathroom to the kitchen. I definitely recommend. Love the scent! I ordered a few and will definitely last a long time. Good price for a very good product! I recommend this to everyone. very clean and good price?good for all surface such as table?sink?machine surface?wall and bathroom?Ideal for kitchen and waiter use?I order 3cases and good for long term? This cleans well and has a great smell that is desirable, not overbearing. It removes strong smelling odors without having to use a lot of it. Great smelling pine cleaner that helps get rid of malodorous issues. We use this daily and the areas are cleaned well but also smell nice too! Price effective alternative cleaner to national brand. we use this item daily to mop and disinfect our cafe. The smell is great and the cleaning quality is fantastic! We have very good results with this pine cleaner. We use it every day in our food operation for mopping kitchen floors. If you have something stuck on the floor you will have to scrub too, We mix it with warm water for better results. Very good price especially when bought in a case. We use this for mopping and works just as good as the more expensive store bought brand. This product is just right in every way. The cleaning power if just what we need. the smell if light and not overwhelming. The fact that it is ai concentrated formula means this will last a long time and then we will order again. A nice cleaner that is great for wiping down bathroom counters and cleaning the floor. The pine scent is amazing. I love the powerful cleaning I am able to do with this product. A great buy. This pine cleaner is great to use for mopping floors! Easily cleans the floor without leaving a residue and has a nice refreshing smell ! A great product with a great price! The best value I have seen so far. This product does the job well and smells great too! 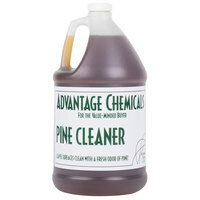 I love the smell and cleaning power of this Advantage Chemicals 1 Gallon Pine Cleaner. I will definitely purchase more of this. Highly recommend it. Love mopping my hardwood floors with this. It smells and cleans just like the name brand version of this. Next purchase I will be buying the case as opposed to a single gallon. SMELLS A LITTLE DIFFERENT THAN PINE-SOL BUT NOT IN A BAD WAY... THE QUALITY IS GOOD AND THE PRICE MAKES IT EVEN BETTER... IF YOU LIKE SAVING MONEY THIS IS THE PRODUCT !!!! I rate this better then Most cleaners. Well priced compared to other competitive brands. Well worth every penney! I fully recommend this to remove even the dirtiest messes. This is the best thing for cleaning. Gives you a nice subtle pine smell and a nice clean floor. You don't need to pour half the bottle in for a good clean. Just a couple cap fills and your all set. It leaves my tile floors very clean and glossy. Best part is that it smells great. One gallon lasts a long way and will purchase again. Pine cleaner is almost equal to the pine cleaner at the dollar store except this is a great value. One gallon will last a long time and you can use in a multitude of rooms in the house to keep things clean and deodorized. This floor cleaner works just like pine sol or any leading brand of floor cleaner. It has a strong but pleasant, not over bearing, smell. The case price can't be beat and it gets shipped right to us. We use this in combination with bleach to clean the floors. So we use it very diluted and it doesn't leave any scent. The only problem we had was with the shipping (not the product itself) in which the product was damaged in transit (we did get a replacement). Liquids should be packed more carefully in stronger boxes. The cleaning ability is pretty average and the scent can be way overbearing so make sure you are using it in a well ventilated space! We loved this floor cleaner. It smells great and we got compliments for who clean the store smells. The price is reasonable. We will definitely order more soon. Similar to name brand cleaner with a fresh scent! Gets the job done on most dirty surfaces! Easy to apply and mop on tiled floors, doesn't leave a film!! nothing like the small of pine running thrue the home. Im very happy with this product. you get 4 in a case now that's a good buy. thanks Wwbstaurant. This is one of my favorite floor cleaners ever used. The smell is amazing i is not too strong, but you can tell you have used a pine based cleaner. It gets our floors super clean. Nothing compares to the fresh aroma of pine. If a client has a space that does not have a cross breeze, a fan might be needed to help disperse the remaining smell. A great cleaner that cuts through dirt leaving a true clean. I love the smell of the pine cleaner,the restrooms smell fresh and cleaned, the price is also very good, I am very happy with the item. As with all the other chemicals on WEBStaurant, the pine cleaner 1) does a fantastic job and 2) is priced lower than what we were previously paying. Win-win situation! I purchased the 1 Gallon Advantage Pine Cleaner and it worked out great and smells good too. We use it on the floor and several other areas. Gets everything nice and clean! The 1 Gallon Advantage Chemicals Pine Cleaner sold 4 / Gallons per case. It is great for cleaning bathrooms, Kitchens, mopping floors. i love the fresh smell of clean pine. I love the strong clean smell this cleaner leaves. Help deodorize some areas when you just don't want the constant smell of bleach. It does a better job than a pine cleaner from the store. So far we have had great luck with all the Advantage products we have purchased. There is no exception here., If you want clean floors that smell as good as they look, here you go. This is a good cleaner, that works well and leaves a pleasant smell behind. The case price makes it a good economical buy for any business.